There will not be a chapter meeting in November to observe Thanksgiving. This is a reminder of a significant event at the Areopagus meeting for this month. Reasons to Believe does not have a November meeting since our normal meeting night lands on Thanksgiving. So we encourage the giving of thanks to the Lord for all our blessings, and encourage the consideration of this opportunity at Areopagus – the combating of “scientism” is part of the common agenda of all Christian apologetics organizations. This month’s meeting of Reasons to Believe will review the DVD series “If God Made the Universe”, an 8-DVD set of sessions which follows the general outline of Dr. Hugh Ross’s book “Why the Universe is the Way it Is”. This DVD set is designed for a home or small group study series. We will view the first of the eight DVDs and discuss not only its content but strategies for its use in initiating outreach with such a study to churches and other groups. RTB has provided extensive online resources for small group leaders. 1: Why Is It so Vast? 2: Why Is It so Old? 3: Why Is It so Dark? 4: Why Is There an Earth? 5: Why So Much for So Little? 6: Why Is It Decaying? 7: Why Isn't It Perfect Now? 8: What Will God Make Next? Bonus Session: What Does All This Say about God? After two months of dealing with questions related to the nature of life processes, this session moves to the large-scale features of the universe that make life possible. As is our practice, time will be reserved for a general discussion of the material. This month’s RTB meeting will be devoted to brief reviews of sources that we have covered in more detail in previous meetings, but with the particular intent of examining those parts of the books that suggest that in the details of life we see evidence of the Creator’s agency and information in ways that go beyond the reach of chance and necessity. The particular resources that will be used are shown below, but there will be a time of open discussion in which we invite you to bear testimony to the way you seen God’s hand in the nature of life. For this months RTB meeting we will examine the controversial area of how modern genetic evidence speaks to the development of life. It has received much publicity, and our attempt will be to look at it through the eyes of a committed Christian biologist, Dr. Darrel Falk, as expressed in his book, “Coming to Peace with Science”. Dr. Falk is national president of Biologos. Both Reasons to Believe and Biologos are making strong efforts to be faithful to the evidence in God’s creation, but there are strong differences in their current views. 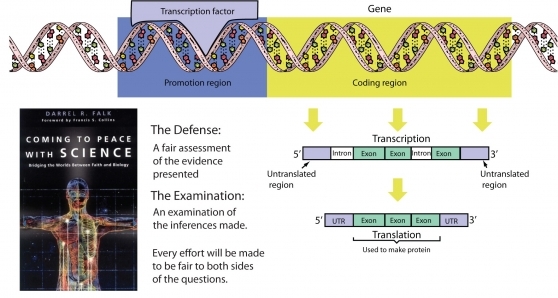 With the hope of learning more about what the genome says, and to examine the differences between RTB and Biologos, we will stage a “trial” in an informal setting. Our members will examine chapters from Falk’s book, trying to faithfully represent his views and responding with their own view. These brief reviews will be followed by a period of general discussion. 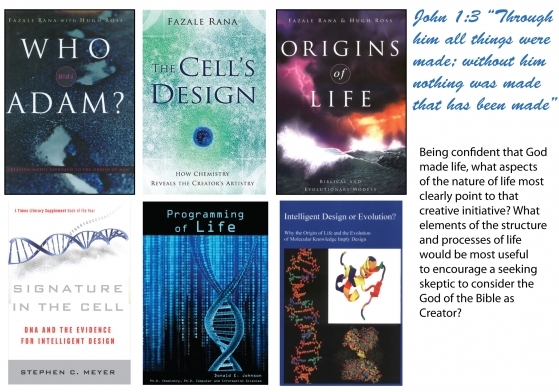 This meeting will be followed in September with a meeting entitled "Evidence of God's Hand in the Creation of Life" where we will examine the writings of Dr. Fuz Rana and Dr. Hugh Ross of Reasons to Believe as well as other authors. These two meetings seek to look at the miracle of life for aspects that clearly point to God's creative initiative and agency. Note that this meeting of RTB Atlanta is scheduled a week earlier than our normal date in order to resolve a date conflict with Areopagus. We encourage participation in the Areopagus forum "Breaking the Spiral of Silence" on June 28 at Perimeter Church. Myth: The Genesis account of creation and modern cosmology are irreconcilable. In fact, RTB was founded based on the discovery that the story told by modern astronomy, cosmology and physics is highly compatible with the Bible, and that only the Bible of all the world’s holy books shows this compatibility. The expanding universe points to a beginning of the universe in the finite past, just as does Genesis 1. As we have studied the unfolding of the universe, a large number of factors have been found to be incredibly finely-tuned to produce a universe that is compatible with life. The conditions of the Earth that make life possible have been found to be likewise optimized for life in ways that suggest the work of an intentional Creator. 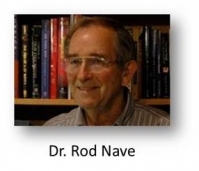 Dr. Rod Nave will set the framework for this discussion, and you are invited to bear witness to your convictions about aspects of the framework of modern science and its compatibility with the record in Scripture. As the wrap-up session for this series, the priority will be on providing time for discussion and sharing. This month’s RTB meeting will be devoted to myths associated with evolution. The perspective on evolution is one of the most pressing current concerns in science apologetics. The agenda will include three brief summary presentations of the stated “myths” and time for discussion. Evidence that the Bible does not allow theistic evolution. "Evolution and Historic Christian Doctrines"
a. Darwin rejected Christianity because he had discovered a more satisfactory scientific explanation for the emergence and development of life forms. c. Darwin had a deathbed conversion to Christianity. The Scopes Monkey Trial destroyed the arguments against evolution. This month’s RTB meeting will be a continuation of the discussion of “10 Myths Related to Science and Christianity” so ably initiated by Jefrey Breshears in our February meeting. This month’s meeting will be devoted to the distortions of history that have been used by materialists to further the atheist agenda. The agenda will include brief summary presentations of three of the stated “myths” and time for discussion. In 2011, the Nobel Prize for Physics was presented to the discoverers of dark energy, a concept that has radically changed the way we view the universe. In this session, we will go over the history of dark energy, it's relationship to dark matter, and the implications it holds for the ultimate fate of the cosmos as well as the existence of a divine Creator. The strongest evidence for dark energy comes from the study of Type 1a Supernovae. The evidence suggest that dark energy may make up 73% of the universe’s content. Analysis of dark energy points to extreme fine-tuning of the creation of the universe. Eric A. Smith received his Master's degree in Physics from Vanderbilt University where he was a member of the Supernova Cosmology Project, the co-discoverers of dark energy. He is currently an Instructor in Physics and Astronomy at Southern Polytechnic State University in Marietta, GA., and a regular attender at Johnson Ferry Baptist Church. An interactive session in Christian apologetics that addresses ten of the most popular myths and misunderstandings regarding the relationship between science and the Christian faith, and how to respond and refute each one. What is the proper relationship between science and Christianity? This is a topic of great importance to Reasons to Believe since part of our Mission Statement is that “sound reason and scientific research - including the very latest discoveries - consistently support, rather than erode, confidence in the truth of the Bible and faith in the personal, transcendent God revealed in both Scripture and nature.” Come and discuss this topic with Jefrey, who is a historian who has taught for twenty years at Georgia State University, Kennesaw State University, and Reformed Theological Seminary and has served as a pastor. His vital work with the Areopagus Christian Study Center http://www.theareopagus.org/ has brought to us many outstanding spokesmen for critical issues related to Christianity and society. We have an EXCELLENT apologetics opportunity in January and have decided to meet at Georgia Tech on January 26 for the main presentation of their Veritas Forum! We will defer the regular January RTB meeting, moving our scheduled programs forward by one month. Our next two scheduled presenters, Jefrey Breshears on Myths About Science and Religion and Eric Smith on Dark Energy have kindly agreed to move their presentations to promote this extraordinary apologetics event. The featured speaker is Satyan Devadoss. Dr. Devadoss is a young Christian mathematician whose research has focused on topology and, by extension, the relationship between mathematics and the shape of the world. He has spoken at the Veritas Forum at Cal Tech and, in the tradition of Veritas speakers, promises a thoughtful and stimulating Christian presentation on contemporary issues on the interface of science and faith. Over the past few years, the Veritas Forums have become a powerful apologetic witness for faith on major secular university campuses. Past speakers at Ga. Tech have included William Lane Craig and Os Guinness. So Dr. Devadoss has a “high bar” in front of him. All indications are that he will have no trouble “fitting in!” See the YouTube of his CalTech presentation below for evidence! The event is being co-sponsored by a number of Christian groups, including Ratio Christi, a newly established Christian apologetics group at Georgia Tech. This alone is something we should support!